The life of Margaret of Anjou was not that of a meek noblewoman content with the companionship of her ladies in waiting. The life of Margaret of Anjou was not that of a meek noblewoman content with the companionship of her ladies in waiting. Rather, it was the story of a woman driven by the desire to do everything in her power to ensure that her husband, Henry VI—wracked by fits of madness in which he withdrew from the outer world to do combat with inner demons—remained king of England long enough for her only son to inherit the throne. From the highs of leading armies into battle, to the lows of wandering penniless along the rockbound coast of Northern England, Margaret led a remarkable life. She was the daughter of Rene, Duke of Anjou, and Isabella, Duchess of Lorraine. At the age of 14, her uncle, King Charles VII, and Henry VI’s chief minister, William de la Pole, Duke of Suffolk, arranged her marriage to the young English king to cement the Truce of Tours in 1444. The two were married on April 23, 1445. Since she was French, it was only logical that she pushed her husband to make peace, rather than prolong hostilities, with her home country. This quickly brought her into conflict with Richard Plantagenet, Duke of York. He scorned her, and she returned his spite. Margaret’s role in political affairs grew rapidly as the royal court was rocked by events in the next decade. The English lost Normandy in 1450 and then Gascony in 1453. After Gascony fell, Henry suffered a severe bout of mental illness that rendered him incapable of ruling for a time. Margaret moved quickly to ally herself with Edmund Beaufort, second Duke of Somerset, who succeeded Suffolk as Henry’s chief minister. The birth of her only child, Edward of Lancaster, Prince of Wales, in October 1453 might have ensured the Lancastrian succession, but York only redoubled his efforts to gain control of the reins of power. Rather than give the regency to Margaret while the king was incapacitated, Parliament chose to award it to York instead. 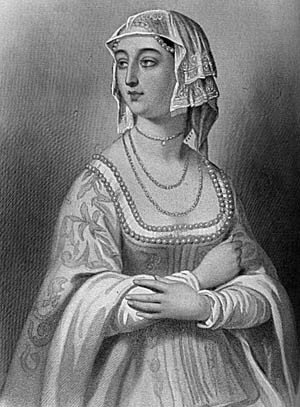 When Somerset was killed at the Battle of St. Albans in May 1455, Margaret took over as the de facto head of the House of Lancaster. Her strong will filled the vacuum of power resulting from Henry’s mental problems and his inability to vanquish internal enemies like York. In the wake of St. Albans, Margaret and Henry spent much of their time in the Midlands rather than London, and she directed the actions of the Lancastrian commanders who defeated the Yorkists at Ludford Bridge in October 1459. After the Yorkist leaders fled abroad, Margaret pressed to have them stripped of their lands and titles and convicted of treason in their absence. Margaret suffered a reversal of fortune the following year when the Yorkists invaded England and captured Henry at the Battle of Northampton in July 1460. After Henry’s capture, Margaret once again defeated the threat to her husband’s throne by calling on the Lancastrian nobility to assemble a mighty host in Yorkshire that ambushed York and killed him and 2,500 of his men outside his ancestral home at Sandal Castle. Despite York’s death, the struggle between the two dynastic houses was far from finished. York’s eldest son, Edward, Earl of March, continued the struggle, defeating a Welsh Lancastrian army at Mortimor’s Cross in February 1460. But the Lancastrian northern army under Margaret’s direction marched south and defeated a Yorkist army led by Richard Neville, Earl of Warwick, at the Second Battle of St. Albans, fought two weeks later. Word of heavy pillaging by the Lancastrians as they tramped through the Midlands spread to London, and its residents refused to allow Margaret and her army to enter the city. With nothing left to do, she retired north to Yorkshire. Meanwhile, Edward entered the capital and was proclaimed King Edward IV. With the authority of the crown behind him, he marched north with a large Yorkist army and soundly drubbed the Lancastrians at Towton on March 29. With her army destroyed, Margaret and her family fled to Scotland. Margaret sailed for France in 1462, where she received enough aid from French King Louis XI to return to Northumberland and start a fresh revolt. A seesaw campaign saw the Lancastrians take several key fortresses, only to lose them again later. Margaret gave up and returned to France in August 1463, where she and her young son lived for the next seven years. It was during her down-and-out period in Northumberland that she and her son—shorn of their former titles and wealth—were frequently spotted wandering aimlessly along the coast. Henry, who stayed behind, was found and captured in northern England. Margaret forged an unlikely alliance in 1470. After Warwick, known as “the Kingmaker,” had a falling out with King Edward, he beseeched Margaret for help in a bid to regain power. Although she despised him, she agreed to join forces with Warwick, provided he agree to abide by her will. Warwick acquiesced, and to seal the new alliance, called the Treaty of Angers, Edward of Lancaster wed Warwick’s daughter, Anne Neville. Facing the threat of a large Lancastrian invasion, Edward IV fled to safe haven in Burgundy. Warwick arrived in England ahead of Margaret, freed Henry from the Tower of London, and restored him to the throne in fall 1470. Meanwhile, Edward IV returned by ship to Yorkshire, recruited an army, and marched south to fight Warwick. On April 14, 1471, the same day Margaret landed at Weymouth, Warwick was defeated and killed at the Battle of Barnet. Margaret next joined forces in Exeter with Edmund Beaufort, fourth Duke of Somerset, and set out with a second Lancastrian army for Wales to recruit additional forces. Intercepted at Tewkesbury as it tried to cross the Severn, Margaret’s army was defeated by Edward’s army. Her son was killed during the rout and both Margaret and Henry were taken to London. Henry was murdered in the Tower on May 12. His death marked the end of the House of Lancaster. Margaret lived for four lonely years in the Tower of London until Louis XI ransomed her in 1475. As part of the agreement, she was forced to renounce all claims to the English crown. To compensate for the ransom, Louis confiscated her French lands, allowing her only a small pension. Margaret died a broken woman in August 1482 at the age of 52. Tags Battle of Barnet, Battle of Northampton, Battle of St. Albans, Duke of York, House of Lancaster, House of York, Hundred Years' War, King Charles VII, King Edward IV, King Henry VI, King Louis XI, Margaret of Anjou, Second Battle of St. Albans, Tower of London, Treaty of Tours, war of the roses, William de la Pole.